Complete antenna and radio system integration provides revolutionary cost/ performance solutions to the Worldwide Broadband Industry. Ubiquiti’s revolutionary InnerFeed technology integrates the entire radio system into the feedhorn of an antenna. 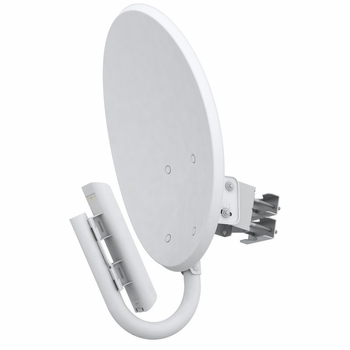 NanoBridge M combines Ubiquiti’s Innerfeed and airMAX (MIMO TDMA Protocol) technologies to create a simple, yet extremely powerful and robust wireless unit capable of 100+Mbps real outdoor throughput and up to 30km+ range. The low cost, hi-performance, and robust “all-in-one” design of NanoBridge M make it extremely versatile and ideal in several different applications.